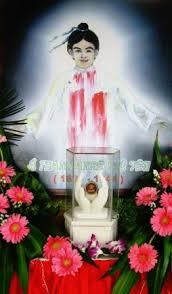 THE FIRST VIETNAMESE MARTYR: ANDREW PHU YEN, A LAY CATECHIST, FACED HIS KILLERS WITH FAITH. By this time last year, on March 5, 2000, the first Vietnamese martyr, a young catechist who in 1644 gave his life for Christ, was beatified by Pope John Paul II. His preaching lasted only a few years, but his witness of faith was intense enough to be remembered by millions of Vietnamese faithful for more than 350 years. In Vietnam, Christianity is widespread; its roots and vibrancy find their source in the merits of generations of catechists who continued to serve Christ and the Gospel for centuries, even after foreign missionaries had been expelled and native clergy prohibited from exercising their ministry. The story of 17th century Christianity in Cocincina (the South), Vietnam, and of Andrew’s place in it, was told by Father Alexander de Rhodes, a French Jesuit missionary, who was for Vietnam what Father Matteo Ricci was for China and Father Roberto de Nobili for India, compiling the first dictionary of the national language and developing the written characters still used today. He was present for the imprisonment, condemnation to death, and martyrdom of Andrew, whose family name is unknown, and wrote the first account five years after the death of the young Vietnamese catechist. Andrew was born in the province of Ran Ran (Phu Yen), and his mother’s Christian name was Joanne. Though extremely poor, his mother had educated her children by her wisdom and dedicated love. The youngest son, with a rather weak constitution but an excellent mind and sound judgment, had a soul that tended towards goodness. At the insistence of Andrew’s mother, Father de Rhodes decided to accept him among his students, and he applied himself to the study of Chinese characters to such a degree that he soon surpassed his fellow students. He received baptism in 1641 along with his mother, only three years before his death, at the age of 19 or 20. One year later, in 1642, Andrew was chosen to meet Father de Rhodes’s trustworthy group of partners and received further training in religious and culture to become a catechist. In 1643, Andrew started his works as a catechist to save homeless souls and to spread the Lord’s words. In the afternoon of July 26, 1644, a captain came with 30 soldiers, commanding that he follow to the place where they would murder him. Andrew gave thanks to the Lord that the hour of his sacrifice had arrived and bid farewell to those with him in prison. Father de Rhodes, following the customs of the land, asked and received permission to spread a mat out under the body of Andrew to catch his blood, but Andrew did not want to accept this. He preferred that his blood fall on the ground, as the Precious Blood of Christ his Lord had. Father de Rhodes respected this decision and knelt beside him. Andrew continued to encourage the Christians present to remain firm in their faith, not to be saddened on account of his death, and to help him with their prayers to be faithful to the end. Spears pierced the left side of his body, and when a soldier brandished a scimitar to decapitate him, he exclaimed in a loud voice, “Jesus!” bearing witness to his Christian faith and love. Despite the passing of centuries, the Vietnamese Catholics who are still living in the country as well as abroad, have never forgotten this young catechist, considering him the protomartyr of our country, and a powerful intercessor for our own coherence and fidelity to the faith. Since then, thousands of Vietnamese catechists have chosen Andrew (Phu Yen) as their patron and an example to continue spreading our God’s words to everybody at every place in whatever circumstances despite the severe and strict control of the communist regime of Vietnam. Bishop Robert J. Baker has chosen this year (2001) as a Year of Reconciliation. What does it mean to us as Andrew’s children? We need to expand our Lord’s world not only within our small scope of a faith community in the Diocese of Charleston, but to those who do not know what Jesus is and how he loves and cares for us, and finally to those who need us most. I am sure with the help and support of Andrew, we can do what Jesus Christ wants us to do. Anthony Tuan Le is a parishioner at St. Mary Church in Greenville.